MrsBrigitte holds a B.Sc. Degree in Forestry and Nature Conservation obtained from the former, Higher Institute of Agriculture and Animal Husbandry (ISAE). She conducted and assisted in different researches Assessing impacts of community development projects on conservation and community livelihoods around Volcanoes National Park (VNP). She got a Training of Trainers (ToT) in Work Readiness, Income Generating Activities and Cooperative Management by Education Development Center (EDC). 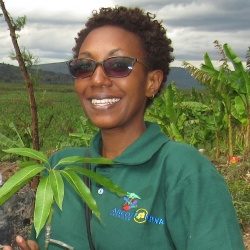 She acquired skills and experience in training different community groups on this curriculum, she technically facilitated them in applying skills acquired to implement new projects and advised them on sustainable natural resources management, especially for communities around Nyungwe and Volcanoes National Parks. Currently, Brigitte is Manager of ARCOS' Community Development Programme and her overall responsibility includes collaborating with the community and other partners in implementing projects that allow people to develop in a safe environment. This to mean, promoting smart environmental practices for environmental and economic benefits. Apart from being passionate for nature, Brigitte likes reading and writing small stories inspired by true stories and she likes listening to classical music.